Matthias Rustemeyer has been trying to collect every individual Mario Kart 64 course world record for half a decade, but thanks to Daniel Burbank that job just keeps getting harder. Burbank has been getting better and better times on the game’s lone Donkey Kong race track since the beginning of the year and shows no signs of slowing down. . The Mario Kart 64 speedrunning website tracks times going all the way back to when the game was released in 1997. According to the record keeping site, Gregg G was the first person to be recognized as the fastest D.K.’s Jungle Parkway racer with a time of 2'36"44. Over two decades later on May 23, 2018, Burbank secured a three-lap combined time of 2'11"93, down .18 seconds from just a week and change ago. During that time the board was mostly dominated by an Irish player called Lacey and one from Australia called Penev, both of whom have been logging record times for years. Jungle Parkway currently belongs to Burbank, a relatively new Mario Kart 64 speedrunner who’s only been competing at the highest level for the past few years. “No one puts this much time into the game and dreams of becoming 2nd,” Burbank told Kotaku in an email. “Everyone wants to be the best.” He’s one of only a few people who have ever dominated Jungle Parkway for any length of time, and thus one of the only left standing in Rustemeyer’s way. It would be wrong to think of him just as a stubborn road block. Burbank, who likes how much attention the Mario Kart 64 speedrunning community has been getting as of late, has demonstrated an innate talent for the Donkey Kong-inspired race track that few can match, possibly not even Rustemeyer. The Jungle Parkway track consists of consists of three main areas. It begins with a short opening loop alongside a river leading up to a ramp that launches you over it. That’s followed by a flat dirt path snaking through the jungle which makes up the bulk of the course. Finally, there’s a long narrow rope bridge that leads into short cave that takes you up a steep incline back to the beginning.. It is a particularly complex course because of all the slopes which make it hard to build up speed through precision drifting and instead put emphasis on anticipating quick changes in turning to drive as straight as short a distance as possible through the myriad 90 degree zig-zags. 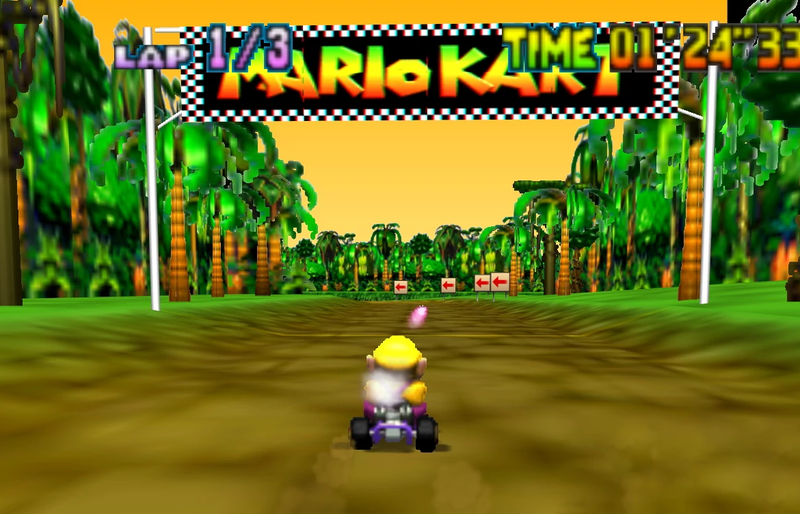 Peach is the best driver for time trials in Mario Kart 64, but her quick acceleration and bad handling make particularly unwieldy levels like Jungle Parkway difficult to master. Burbank’s recent runs have been extraordinary and show signs that they could be even better. As unofficial Mario Kart 64 speedrunner White Goose pointed out, on his most recent world record, Burbank managed to beat his previous time despite a slower second lap due to taking one of the course’s ramp jumps at a sub-optimal angle and getting hit by an coconut while coming around the subsequent corner (1:16 in the above video). This led to an almost half-second difference between his times for the second and third lap, meaning that even at his best Burbank still has obvious room for improvement. While Rustemeyer has struggled to grind out practice sessions with many laps on the course below 44 seconds, they’re routine for Burbank, especially due to his knack for nailing the difficult cave jump at the end of each lap. Jungle Parkway snakes through a tunnel in the last stretch, but skilled players can skip right up the side of the rock face to the exit by sliding and then boosting just perfectly into a series of quick hops. It’s a difficult maneuver to pull off, but especially hard to nail perfectly, though Burbank seems to do it without blinking whenever he’s streaming world record attempts on Twitch. That’s part of why, since he first won the world record for it last October, he’s only lost it once and managed to break his own record several times already this year. He’s making incredible progress in one of speedrunnings currently most optimized games and it’s going to be tough for anyone to catch up.